FishingNosara offers complete Costa Rican Sportfishing packages. Our Captains and Crew are professional, courteous, English-Speaking locals who know all the nuances of the local waters. 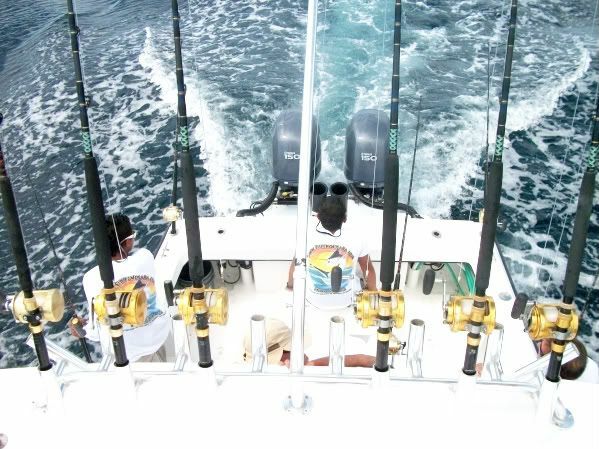 We use only top-of-the-line tackle and our boats are the best-equipped in the whole area. Our on-shore support staff provides all the essentials including food, water, ice, plastic bags for filets, sunscreen, transportation to the boats, and much more. Plus our friendly office staff allows you to conduct business in a safe and secure environment. All of our Fishing Packages are personalized to the size of your group and the type of fishing you desire. We offer first class airport transfers from San Jose and Liberia, Pura Vida style Paradise Rentals, and a wide array of fishing options from Kayak River Fishing to Super Panga Fishing to fighting Blue Marlins on our 31′ Sportfishing Battle Wagons! Let us help make your Costa Rica fishing vacation an unforgettable experience! Have a look around our site, sign up for our monthly Fishing Reports, and if you need a question answered give us a call at our US office at (904) 591-2161 or at our Costa Rican Office at (011)(506) 2-682-0606. Tight Lines and Pura Vida!